Give your facility’s shower a clean, fresh look with our commercial-grade shower curtains. 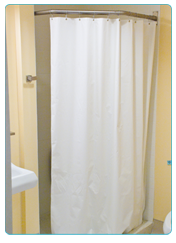 Our hospital shower curtains have the ideal combination of style & quality. To order, select a hospital shower curtain material below, find your size, and select your color.